The module works with three Yandex payment services. 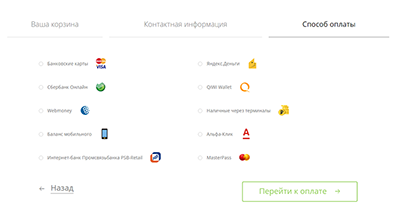 Yandex.Checkout allows accepting payments on the website. All popular methods are available: bank cards, e-wallets, cash, online banking, direct carrier billing, and others. This is a service for business: the funds are credited to the company's settlement account. 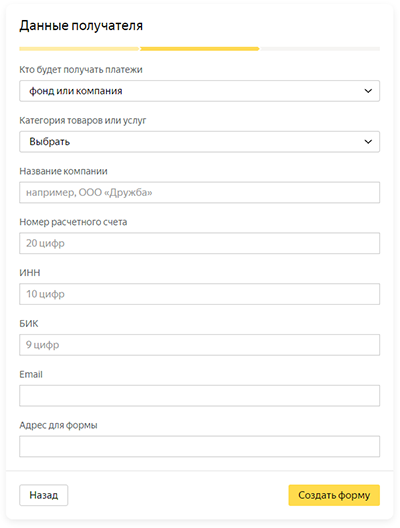 The contract is not required, but you need to pay a fee of 3000 ₽ for using the form. 1. Download the archive containing the module. 2. Click Apps — Installer in website's dashboard. A page with the list of packages will open. 3. Click Download add-ons — Download the package. 4. Download the archive containing the module (Select package — Download). 5. Close the downloads window once its done. Find YandexMoney on the page with the list of packages, and click Install — Installation options — Install package. 8. Create a successful payment page and a payment error page. 1. 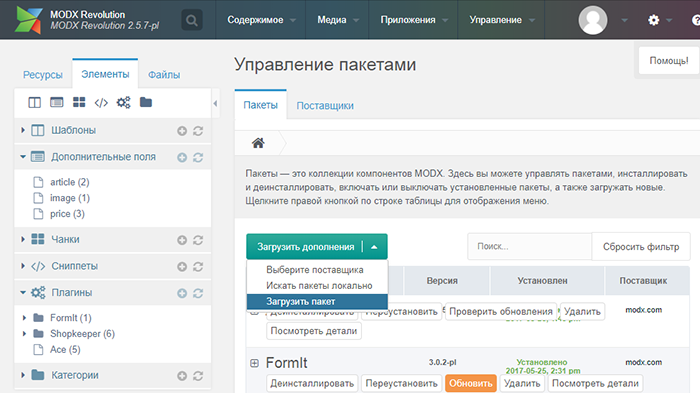 Open the website's dashboard and select Yandex.Money in the left-hand menu (Elements tab in the Snippets section). 2. Select the Parameters tab and click Default settings are blocked: this button unlocks the module settings so you can configure them. 3. Fill out the module settings as in the table below. Внимание. To edit any field, double-click on the value in the far right column. 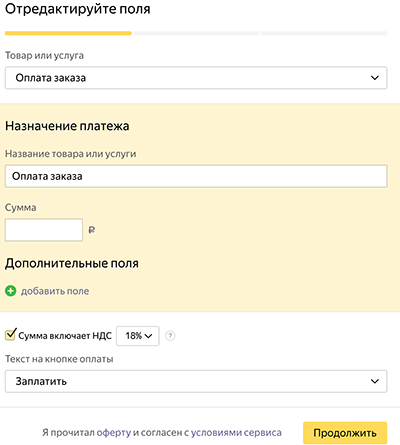 If you fiscalize payments using the Yandex.Checkout solution, select your VAT rate on the right. 4. Save the settings. That's it, now you can test payment acceptance. 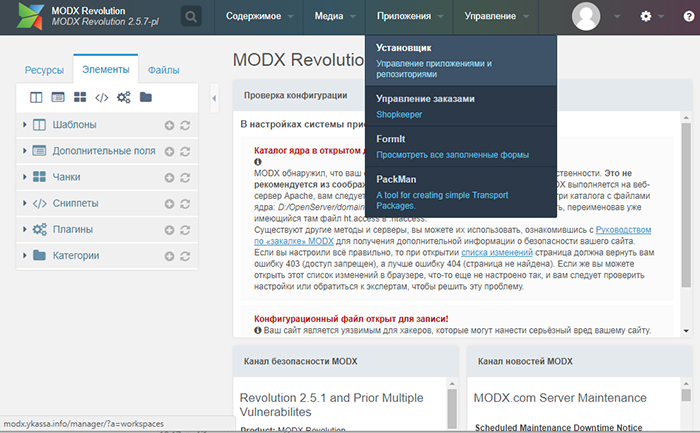 Open the website's dashboard and select Yandex.Money in the left-hand menu (Elements tab in the Snippets section). Select the Parameters tab and click Default settings are blocked: this button unlocks the module settings so you can configure them. 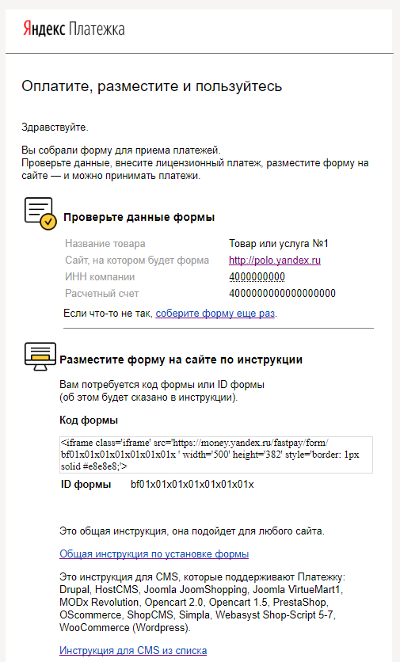 ya_billing_id Copy the ID parameter to this field from the Yandex.Billing email (sent after you created the form). 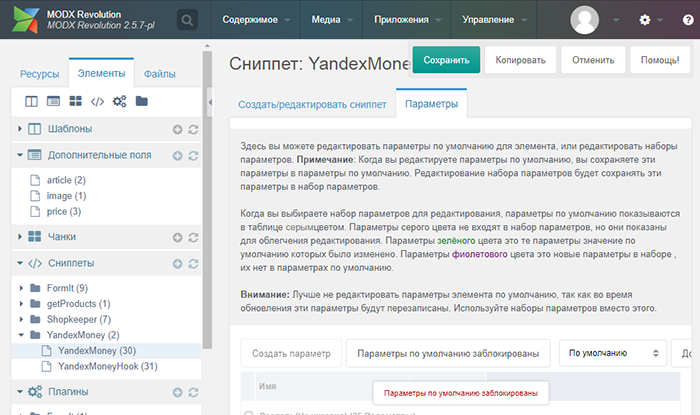 ya_billing_purpose Do not change, or indicate everything that will help distinguish the order paid made via Yandex.Billing. This parameter will be used in the payment order. ya_billing_status Select the status to be assigned to an order after it's been paid via Yandex.Billing. The status should indicate that the payment result is unknown: you can only find out whether the customer paid or not from the email notification. Pay 3,000 rubles using the banking details. Pay from the settlement account that you will use for accepting payments (otherwise, the fee will not be considered as paid). Внимание. Important: one paid fee covers all the forms that you select for your company (we check by INN (TIN) indicated during the creation of the form). Limitations on quantity and amount of payments also apply to all forms at the same time.